A 99.9% complete Neanderthal genome from a toe bone found at Denisova Cave (Altai, Southern Siberia). Documents at Max Plank Institute for Evolutionary Anthropology, Department of Evolutionary Genetics. The genome sequence was generated from a toe bone discovered in Denisova Cave in southern Siberia in 2010. The bone is described in Mednikova (Ethnology & Anthropology of Eurasia 2011. 39: 129-138). DNA sequences were generated on the Illumina HiSeq platform and constitute an average 50-fold coverage of the genome. 99.9% of the 1.7GB of uniquely mappable DNA sequences in the human genome are covered at least ten times. Contamination with modern human DNA, estimated from mitochondrial and nuclear DNA sequences, is around 1%. The figure shows a tree relating this genome to the genomes of Neandertals from Croatia, from Germany and from the Caucasus as well as the Denisovan genome recovered from a finger bone excavated at Deniosva Cave. It shows that this individual is closely related to these other Neandertals. 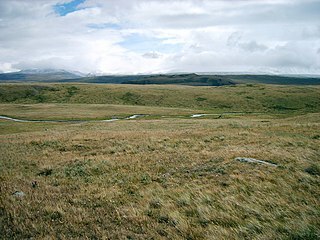 Thus, both Neandertals and Denisovans have inhabited this cave in southern Siberia, presumably at different times. It is still possible, considering its position in the tree that the Altai Neanderthal had minor “Denisovan” admixture. But it would be very minor in any case. Ancient mtDNA from the oldest known dog remains (ref. of its discovery in 2011) places it unmistakably in the dog subspecies. This does not just confirm that domestic dogs existed do far back in time but also that modern domestic dogs have such deep origins. The origin of domestic dogs remains controversial, with genetic data indicating a separation between modern dogs and wolves in the Late Pleistocene. 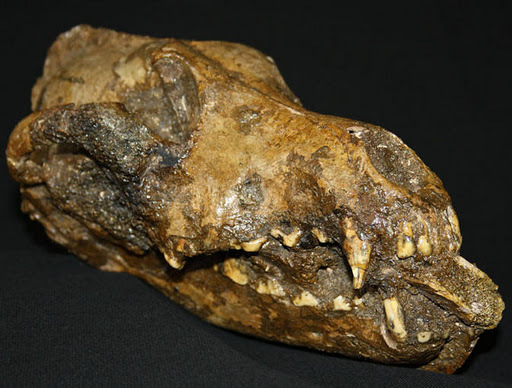 However, only a few dog-like fossils are found prior to the Last Glacial Maximum, and it is widely accepted that the dog domestication predates the beginning of agriculture about 10,000 years ago. 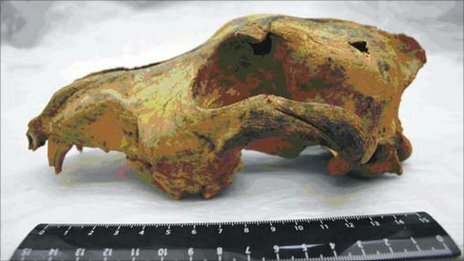 In order to evaluate the genetic relationship of one of the oldest dogs, we have isolated ancient DNA from the recently described putative 33,000-year old Pleistocene dog from Altai and analysed 413 nucleotides of the mitochondrial control region. 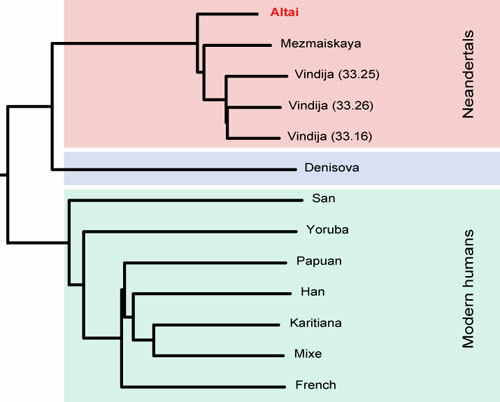 Our analyses reveal that the unique haplotype of the Altai dog is more closely related to modern dogs and prehistoric New World canids than it is to contemporary wolves. Further genetic analyses of ancient canids may reveal a more exact date and centre of domestication. The Altaian Upper Paleolithic dog belongs to clade A, the most common one among modern dogs, including some pre-Columbian lineages from America and such different breeds as the Siberian Husky, the Irish Setter, the Dachshund, the Toy Poodle or the Pug, just to mention a few (see Supp. Table 2 for a longer list). The authors also compared the lineage with Upper Paleolithic wolf remains from Altai, which are not closely related. prehistoric canids (pre-Columbian dogs, eastern Beringian wolves). values are shown with an asterisk whenever larger than 50. Surely the presence of four different generic Canis lupus mtDNA clades in modern dogs indicates the domestication of at least four different wolf females, either in the same or different places. This finding puts to rest the Neolithic hypothesis of the origin of modern dogs (alleged second domestication, because UP dogs were known) and is at least consistent with my favorite hypothesis of dog domestication in SE Asia (ref 1, ref 2) within the context of the early expansion of Homo sapiens in Eurasia-Australasia in the late Middle Pleistocene, with backflow via South Asia to the West, where dogs may have played a decisive role in the long-term competition with the strong and intelligent Neanderthals. A recent discovery of Iron Age burials (Pazyryk culture) in the Altai Mountains of Mongolia may shed light on the mode and tempo of the generation of the current genetic east-west population admixture in Central Asia. Studies on ancient mitochondrial DNA of this region suggest that the Altai Mountains played the role of a geographical barrier between West and East Eurasian lineages until the beginning of the Iron Age. After the 7th century BC, coinciding with Scythian expansion across the Eurasian steppes, a gradual influx of East Eurasian sequences in Western steppes is detected. However, the underlying events behind the genetic admixture in Altai during the Iron Age are still unresolved: 1) whether it was a result of migratory events (eastward firstly, westward secondly), or 2) whether it was a result of a local demographic expansion in a ‘contact zone’ between European and East Asian people. In the present work, we analyzed the mitochondrial DNA lineages in human remains from Bronze and Iron Age burials of Mongolian Altai. Here we present support to the hypothesis that the gene pool of Iron Age inhabitants of Mongolian Altai was similar to that of western Iron Age Altaians (Russia and Kazakhstan). Thus, this people not only shared the same culture (Pazyryk), but also shared the same genetic east-west population admixture. In turn, Pazyryks appear to have a similar gene pool that current Altaians. Our results further show that Iron Age Altaians displayed mitochondrial lineages already present around Altai region before the Iron Age. This would provide support for a demographic expansion of local people of Altai instead of westward or eastward migratory events, as the demographic event behind the high population genetic admixture and diversity in Central Asia. Surely the most interesting finding of this study is that, unlike all other studies so far in the area, Bronze Age Pazyryk burials from Mongolia carried 100% (3/3) Eastern Asian haplogroups (all D). Only one sample from the same wider region and period had ever before produced some Eastern lineages but as minority (9%, Southern Siberia, Turbat 2005), all others producing instead 100% Western haplogroups. Figure 2. Spatial frequency distribution maps of East Eurasian lineages. traced back to the Iron Age.